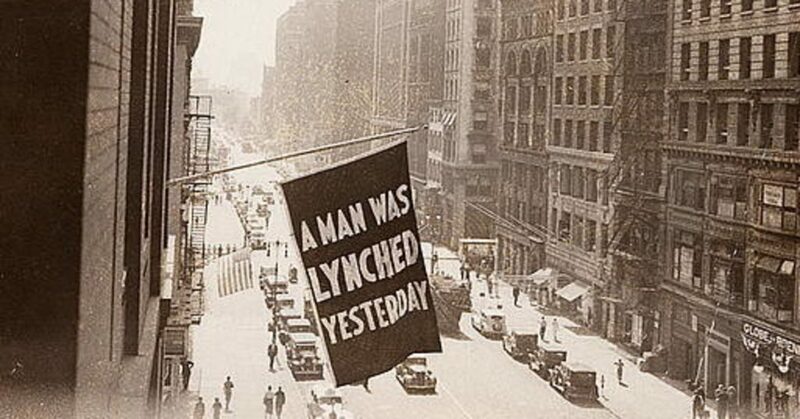 From 1920 through 1938, the NAACP used to hang a flag outside their New York headquarters the day after someone was lynched. It read “A Man Was Lynched Today” in graphic white letters on a black background and was part of an ongoing public campaign to draw attention to the reality of the widespread terrorism of black people in America. In 2015, artist Dread Scott made the artwork A Man Was Lynched by Police Yesterday in response to the murder of Walter Scott, whose shooting by a policeman as he fled was captured on video and shared widely. 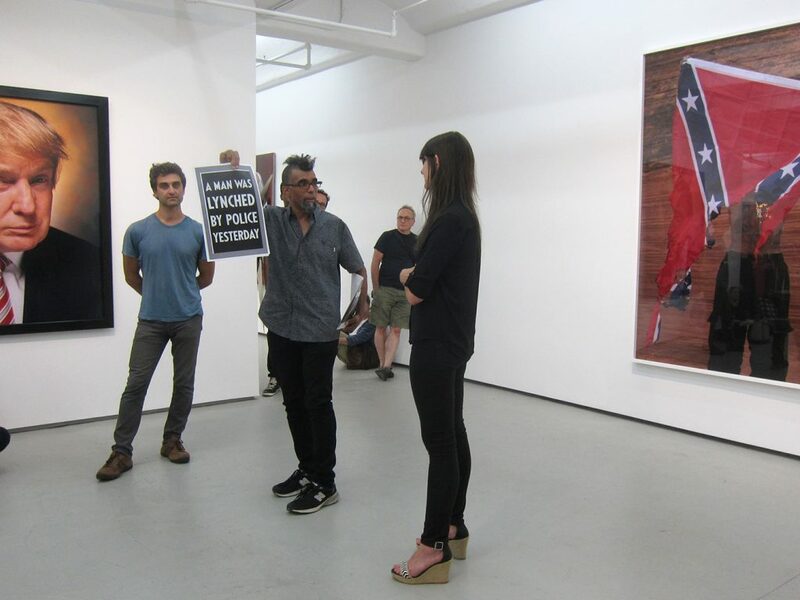 The banner looks exactly like the flag that the NAACP flew originally, except for the addition of two words: “by police.” The artwork has been hung in a number of different exhibitions, but early on was shown outside the For Freedoms exhibition organized by Hank Willis Thomas at New York’s Jack Shainman Gallery on July 7, 2016 where it received significant positive and negative national attention. 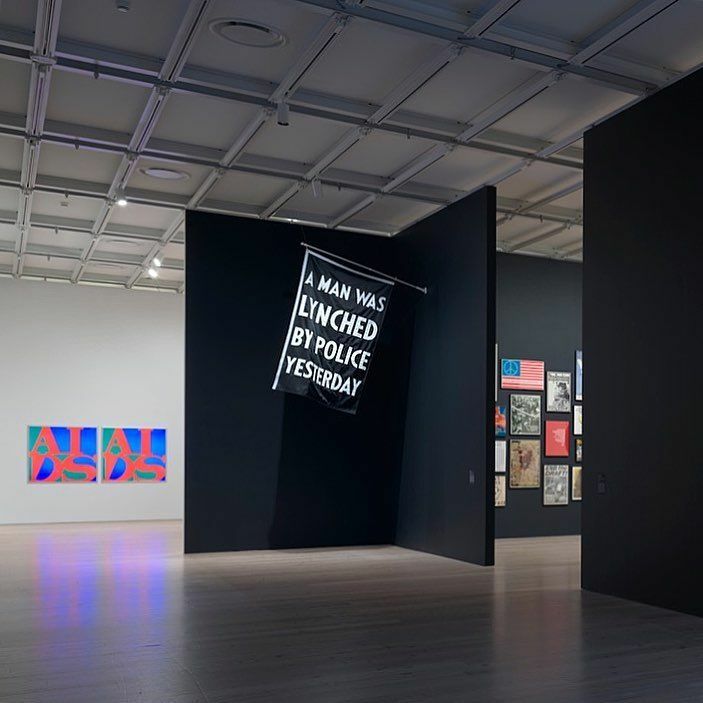 Since that time, Scott’s banner has been shown in other iterations and exhibitions, including a prominent inclusion in An Incomplete History of Protest at The Whitney Museum. 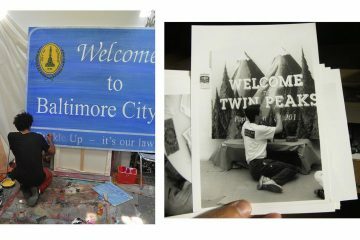 And now, it will be on display publicly in Baltimore, a project organized by ArtSite Old Goucher, led by Kelly Cross, and produced by KADIST via Joseph del Pesco, the International Director of KADIST who is now based in Baltimore. This is this organization’s second public art project, and it’s no less political than its first: the installation of Zoe Leonard’s I Want A President on the side of a rowhouse in the Old Goucher neighborhood. As the organizers get ready to hang Scott’s banner on Tuesday, August 7 at 6 pm at the intersection of North Avenue and St. Paul Street, the artist agreed to talk about the project. 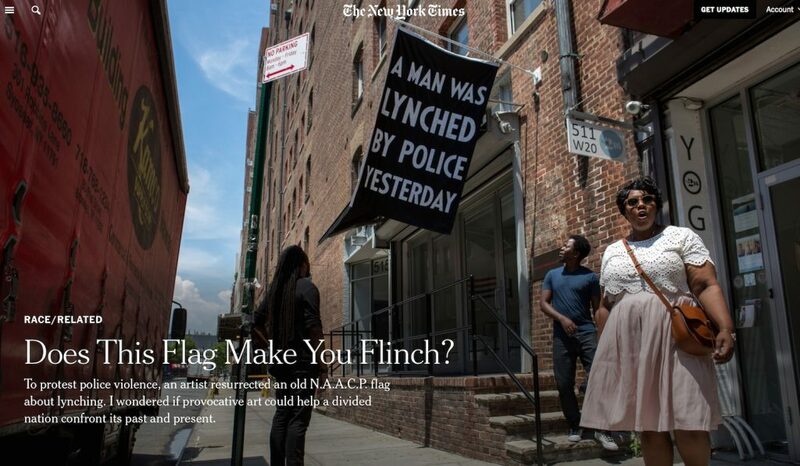 Joseph del Pesco: Appearing on North Avenue in Baltimore this week is your update of a NAACP banner that used to hang outside of their national headquarters in New York on Fifth Avenue the day after someone was lynched. The original, which was displayed during the 1920s and 1930s, read A MAN WAS LYNCHED YESTERDAY. You’ve added two words: BY POLICE. On one hand, the banner speaks for itself—its message is clear—on the other hand, it carries forward an important historical call-to-attention, perhaps especially poignant in a majority Black city like Baltimore, and one which is host to the headquarters of the NAACP. But you’ve also suggested that the banner is symbolic of an invisible and persistent “threat that hangs over all Black people” today. What is that threat? 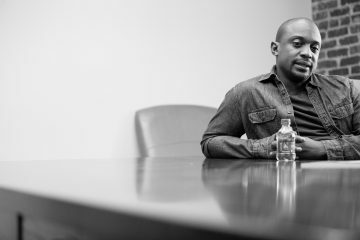 Dread Scott: The threat that hangs over Black people is death. Death at the hands of the police. Many of my projects look at how the past sets the stage for the present, as well as how the past resides in the present in new form. The NAACP flew “A Man Was Lynched Yesterday,” the day after anyone was lynched. It was part of their anti-lynching campaign. People rightly see lynching as a horror from the past, and by and large in the 21st century, Black people aren’t strung up from trees or set on fire in front of crowds of cheering white onlookers. During the time the NAACP had their anti-lynching campaign, and really from 1865-1965, Black people knew we could be lynched for any reason or no reason whatsoever. It was a terror that hung over all Black people even though most weren’t lynched. Today, the police have inherited the roll of terrorizing the Black and Latino community the way lynch mobs did during the Jim Crow era. Today, the police kill people, of all races, at five times the rate people were killed at the height of lynching and those stolen lives are disproportionately Black. Much the way that Mamie Till cautioned her son Emmett about how to behave in the south, to avoid being lynched, Black and Latino families have talks with our children when they turn 13 or 14 about how to survive an encounter with the police. And we know that any advice we give is likely useless. Black people have been killed by cops for a traffic stops, for selling CDs, for selling cigarettes, for having our hands up, or not having our hands up. Standing still or fleeing. It’s not our behavior, but the behavior of cops with a license to kill that caused the names Mike Brown, Tamir Rice, Eric Garner, Oscar Grant, Freddie Gray… to become known nationwide. 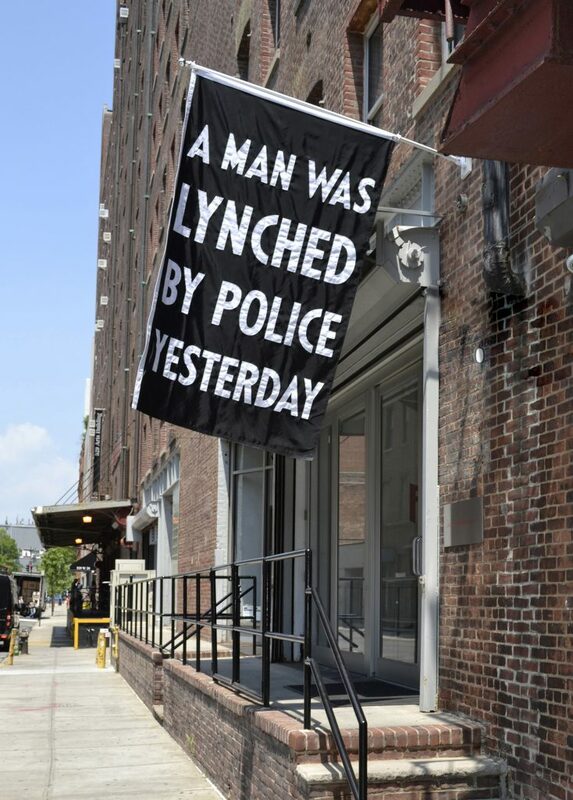 Artwork based on NAACP banner “A man was lynched yesterday” Made in reference to the epidemic of police murder on the occasion of the videotaped police murder of #WalterScott; Installed at Jack Shainman gallery July 8 2016. 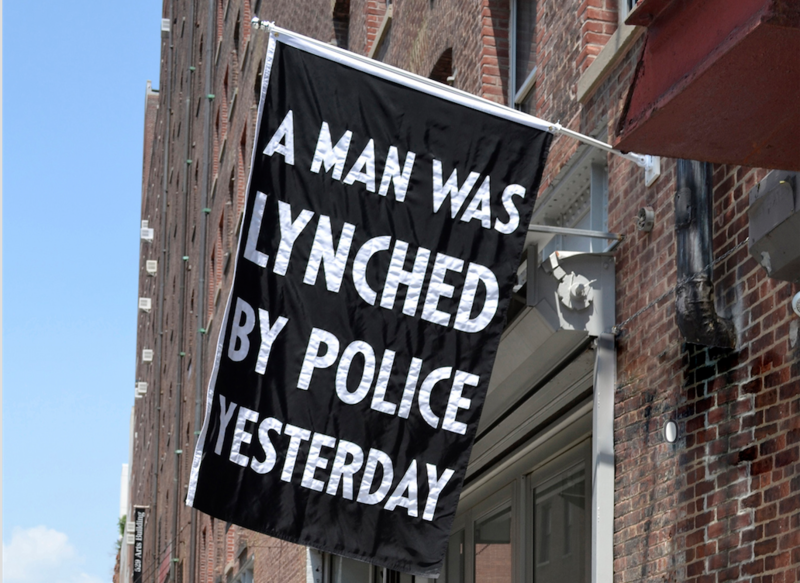 “A Man Was Lynched by Police Yesterday,” 2015, nylon 84 x 52 1/2 inches ©Dread Scott. Courtesy of the artist and Jack Shainman Gallery, New York. 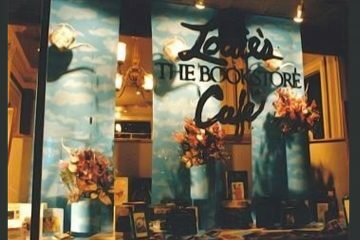 If I interpret the shape and size of the banner like one might a painting or sculpture, reading its form for meaning, I notice that the banner, at 7 feet tall and approximately 4 feet wide might be recognized as a spatial approximation of a person. And I’ve also noticed that the word “hang” is often used when talking about banners (and that the word appears both times I quote you in my first question). These two observations might suggest that the form and linguistic context reinforce and deepen the meaning of the language displayed on the banner. Do you recognize these, or other kinds of aesthetic or symbolic associations? I don’t know about those references. The original NAACP banner was larger and if this showing of the work were in another context, perhaps a few stories up on a taller building as the NAACP headquarters in NY in the 20s and 30s, I might have presented a larger banner. The banner and dimensions are stark. They are big bold letters—white on a black background, with a font that seems like it’s from the 20s, because it is. That relation between form and content matters. And the conceptual link to the NAACP banner matters for the art. The black-and-white of the banner-and-text reflect how we discuss racial politics matters. But looking for subtext of linguistic coincidence and the size of the banner seem to be staring away from what is central to the work. During discussions about the banner in the past, you’ve noted that “The NAACP banner wasn’t just a marker of the horror and tragedy, it was actually part of organizing people across the country to fight…” The public presentation of the banner in Baltimore is only one of a series of installations in various cities in recent years, and part of a campaign and fight against racial injustice in the US. By presenting the banner here, we stand in solidarity with that fight. Where else has the banner been presented? The banner has been presented at 20 different venues. 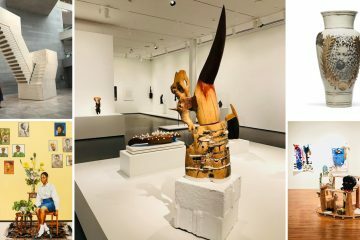 The venues have included museums, alternative spaces, commercial galleries and outdoor public displays. Most shows have been in the US, the banner has also been displayed in Capetown South African and Milan, Italy. The work was first presented at Moberg Gallery in Des Moines IA, soon after the police murder of Walter Scott—the killing that prompted me to make the art. It was well received but mostly un-noticed outside of Des Moines. The next showing was at Jack Shainman Gallery in NY. The exhibition For Freedoms was on view in the summer of 2016 and I had work in it. During the exhibition, the police killing of Alton Sterling and Philando Castile in separate incidents, 36 hours apart. I felt it would be important to have this work on view as people around the country mobilized to fight for justice for Sterling and Castile and to demand an end to murder by police. I asked Hank Willis Thomas, who organized For Freedoms and the gallery whether we could add the banner. Instead of the “no” I was expecting, the gallery asked me to get there as quickly as I could with the work and they proudly displayed it outside, above their entrance later that day. It received tremendous attention, largely because of how people were active in the streets and because the work resonated with what was on people’s minds. What was the response like in the various cities? The response was overwhelmingly supportive. There was favorable media coverage, in a range of publications. It appeared on the front page of nytimes.com, in multiple stories on Hyperallergic, Revolution Newspaper, and PBS Newshour Magazine. There were many visitors to the exhibition in New York, and supportive tweeting about the work and postings on Instagram. But there were also hostile responses. The Shainman gallery’s landlord threatened eviction if they didn’t remove it (from the building’s exterior), which was reminiscent of the response the NAACP got in 1938. Fox News railed against the work and this led to some of their viewers threatening the gallery and its staff, as well as me personally. Because of the heated nature of this show and the threats both to the gallery and demands to censor the work more generally, I encouraged other institutions to exhibit the work. 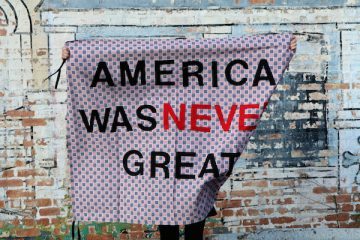 Many venues responded—SPACES, an alternative space in Cleveland, partnered with a community bookstore to show the work during the Republican National Convention; The African American American Museum in Philadelphia added it to an exhibition in time for the Democratic National Convention; The Contemporary Art Center in New Orleans raised it in the region where Alton Sterling was killed and blocks from a confederate monument to Robert E. Lee that was the center of much debate; the Whitney Museum acquired the work and is currently displaying it as part of “An Incomplete History of Protest,” an important show of works from their collection. I’m touched that it is about to be seen in Baltimore, a city where the police murdered Freddie Gray and where people have responded with such heart and courage to that killing. The installation of Dread Scott’s banner was organized by ArtSite Old Goucher, led by Kelly Cross, and produced by KADIST. Joseph del Pesco is the International Director of KADIST. The banner will be installed on Tuesday, August 7 at 6 pm, corner of North Avenue and Saint Paul Street. All are welcome to attend.